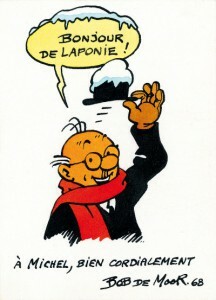 In 1967, after one year of total absence, Monsieur Tric would reappear in the Tintin/Kuifje weekly with the story “Le sapin de Laponie” / “De spar uit Lapland”. The 4-page Christmas story was featured in the issue with number 51 published on December 19. It would take another year before Bob De Moor would return with another Monsieur Tric story, again a Christmas one, when “Vacances d’hiver” / “Meester Mus gaat naar de wintersport” would be published in issue 52 published on December 24 1968. BD Must re-published this story in their Monsieur Tric package (volume 5 to be precise, page 20-23) which you can order right here. So why do we bring up this story? Yesterday Michel X contacted us to inform he had a drawing by Bob De Moor from 1968 on which you can see Monsieur Tric saying: “Bonjour de Laponie! A Michel, bien cordialement“, signed Bob De Moor 1968. It must be that Bob De Moor made this drawing somewhere right after New Year’s Day of 1967 as he was still in the mood of Monsieur Tric visiting Lapland. The drawing is made with Chinese ink and colored with what we presume is ‘écoline’, a liquid watercolor paint. According to Johan De Moor ‘écoline’ was the favorite coloring technique used by Bob De Moor but we’ll let him tell more on that in the future. The whole is drawn on a cardboard support and measures 8 cm X 11 cm. As it happens this drawing was sent to Michel after having contacted Bob De Moor via the Tintin weekly. For those wondering what Lapland is (shame on you really), it is a region in northern Fennoscandia, largely within the Arctic Circle. It stretches across Norway, Sweden, Finland and Russia. On the north it is bounded by the Barents Sea, on the west by the Norwegian Sea and on the east by the White Sea. The name Lapland refers to land inhabited by the Sami people, formerly called Lapp people, which is now considered derogatory. One of these Sami is also depicted wearing his traditional clothes in the Monsieur Tric story. If you want to know more about this fantastic geographical spot, check this Wiki page. It’s a must-visit region.